When visiting my brother's family, we had a little belated birthday celebration for my nephew, who had just had his first birthday. My sister-in-law, Meredith, and I made a joint effort in Elmo cupcakes. Dean was extremely cute when eating his cupcake. 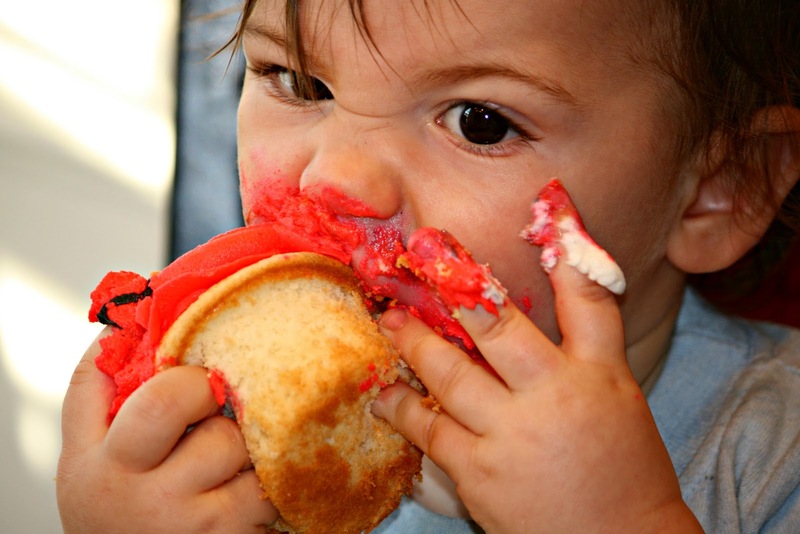 In the middle of his feast, he started sucking his thumb and rubbing his face with the cupcake as though it were a blanket. Adorable. This is too cute Lisa! Made me remember the kidling diving (literally!) headfirst into the Raggedy Ann cake I made for her first birthday. Wow! clean up time!Looks like he was having alot of fun here! He looks so happy. I bet the the cupcakes were adorable! Such a sweet baby! He looks well satisfied with his efforts. :-) And the cupcakes look delicious! I have no children of my own - BUT, i work with them all the time. A couple of years ago, at one of my regular story times I looked up to see a tiny girl with chocolate all over her face. She looked like a commercial - the kind art directors pay a lot to produce - She'd been consuming - no, it's better said - she'd been enjoying an Oreo (I offer cookies at this story time) - they were the "original" - with white inside - she'd enjoyed it - somehow getting the chocolate all over her face . . . Kids - they are such a beautiful wonder. Hahahaha... cupcake covered babies are really cute. They sure can make a mess can't they? I remember my son's first birthday...it went something like that also! But my favorite pics of him at that stage, are when his slightly older sister, covered his head in peanut butter for dog Charlie to lick clean! Woah, that's a messy baby! I'm kind of a clean freak so I'm getting anxious just looking at that photo haha. Oh my gosh, best birthday pictures ever, lol!! Happy birthday to your nephew. Oh my gosh! He is so cute! Love those eyes! Oh my gosh! Does that say "good" or what? SO cute!!! And he has the right idea, a cupcake can be a better comforter than a blanket! laughing out loud! unbridled joy! Obviously the cupcakes were a hit! Wow! Pictures like that only remind me of why I chose not to have children. I would have been having a fit about the mess. Oh, this takes me back to Amy's first birthday! She did the same thing:) Cute little nephew you've got, Lisa! I love cupcakes.. I really think cupcakes for birthdays are better than cake.. Such a cutie..he sure enjoyed this cupcake..Happy Birthday~!~! Cha Cha Cha~!~! And this little puggy would like to taste some of that frosting from that cute little face. Oh my God, that is indeed cute! agreed! cupcake covered babies are adorable! Yep. 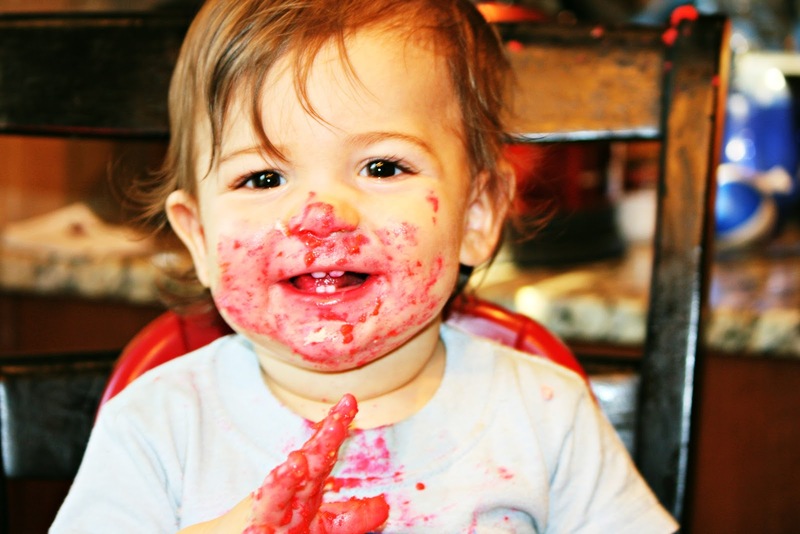 Babies and messy food never gets old.